Samuel N. Cohen Auditorium in St. Boniface Hospital. Manitoba Photo Events is excited to announce that we will be hosting Michelle Valberg (www.michellevalberg.com) in Winnipeg on May 4, 2019. For 30 years Michelle Valberg has photographed wildlife and landscapes with the intention of regenerating simple beauty into a deeper reflection of humanity. Michelle’s portrayals of the natural world aim to draw viewers toward inner contemplation, based on the idea that building awareness and educating others through nature photography can inspire people to be better stewards of the natural world. By developing a deeper understanding of the interconnections between people, animals, and the environment, she believes that others can be motivated to take action in their local communities and beyond. Michelle is a Canadian Nikon Ambassador and the first Canadian Geographic Photographer-in-Residence. She is a fellow of the Royal Canadian Geographic Society and the prestigious Explorer’s Club in NYC. 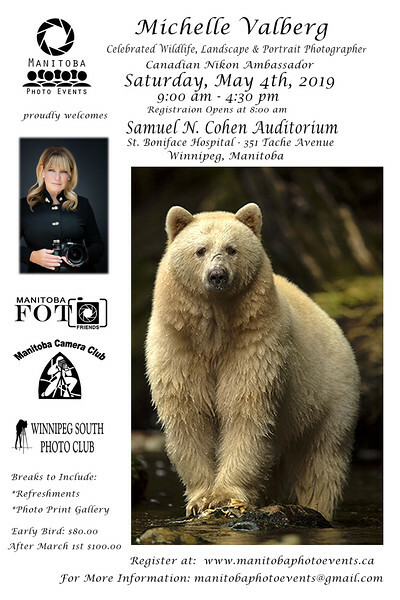 Please see attached poster or visit our website (www.manitobaphotoevents.ca) for all the details on how to sign up. The price is currently only $80 per person but will increase to $100 after March 1st so be sure to register early. We also have a special rate for high school students (limited seats); details are available on the registration page of our website. 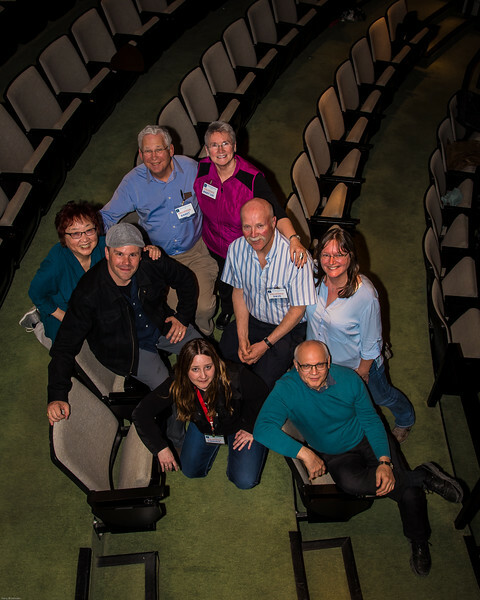 We hope you can join us for a fantastic weekend of photographic learning and inspiration! 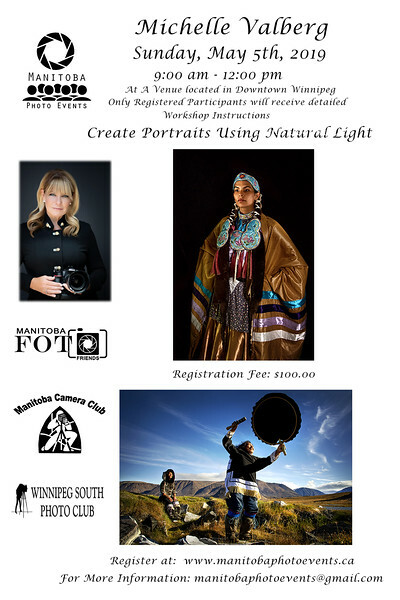 Join Michelle Valberg and Manitoba Photo Events for a Portraits Using Natural Light. Michelle will go through various posing techniques using only available backgrounds and light. Michelle will discuss how she stays creative, spontaneous and connected to her subject throughout her portrait session. This workshop promises to be fun, informative and get the Sunday morning creative juices flowing..
After December 15, 2018 if there is a waiting list for any of the clubs and any of the other clubs have any available openings, those spaces will be filled from the waiting list. After March 1, 2019 if there are any openings for the workshop not filled by any of the clubs, these spots will be offered to all registrants of the MPE event. If you meet the above requirements and would like a workshop space, then email our Registration Coordinator, Heather Beckstead, at: manitobaphotoevents@gmail.com on or after November 12, 2018 at 12 noon. Be sure to indicate your full name, which club you belong to. Workshop spaces will be allocated on a first come, first served basis and each club has only 8 spots per workshop (for a total of 24 people) This will sell out FAST so remember… your request will be accepted ONLY if you are already registered for the Saturday presentation. If we receive a request for a spot with no paid Saturday registration, your request will be denied.